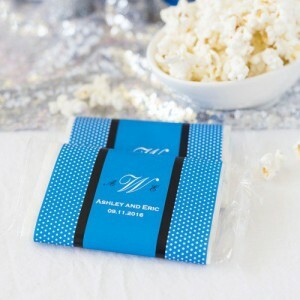 This week’s fun wedding favor is ideal for couples who are hosting a group of out-of-town guests! These personalized bags of microwave popcorn would be the perfect addition to a care package. You could create care packages for each of the out-of-town guests and include items such as bottled water, hand sanitizer, and of course treats just like this microwave popcorn! Of course if you’re having a smaller reception and everyone is from the same area you could always put the packages of popcorn in cute baskets at the reception and encourage guests to take one or two on their way out. The bags can be personalized with a wraparound label of your choice – you get to choose the color and what the label says. You’ll find these personalized bags of popcorn here.